ARMED police evacuated workers and passengers from Holborn in London after receiving reports of a terror alert. But the terror alert turned out to be a false alarm and the police scene was stood down shortly afterwards. The warning comes as London remains on high alert following last Friday's Parsons Green tube attack, that left 30 people injured after the crude bucket bomb partially exploded on a District Line train. Today the Metropolitan Police confirmed officers were called to reports of a suspicious package near Holborn, central London, with specialist officers being scrambled to the scene at 12.35pm. Officers raced to Great Queen Street and cordoned off the road - which runs between Covent Garden and Holborn Tube stations. Witnesses reported a large police presence in the area and pictures on Twitter showed several police cars and officers in the cordoned-off street. Several social media users also described the chaotic scenes as people were evacuated from offices, cafes and even hair salons by officers. One person said: "Suspect package found in Holborn. A lot of the buildings around us evacuated. Everything seems very calm and controlled right now." Another added: "Bomb scare literally around the corner from my office nr #Holborn Station. "Police working awesomely and evacuating everyone safely." Police were also scrambled to another bomb scare in London this afternoon, with nearby Leadenhall Market coming under lockdown as shoppers were evacuated. 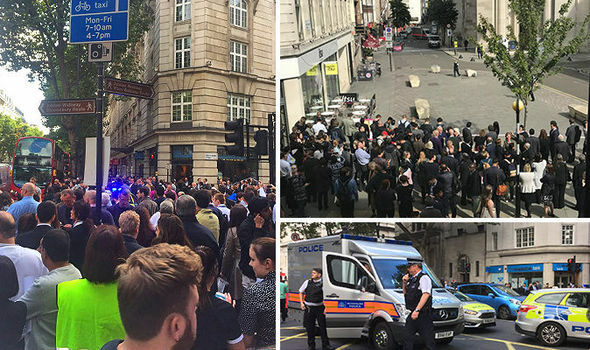 The evacuation today come just days after Britain was hit by its fifth terror atatck this year after a homemade bomb was planted on the London Underground. Images posted on social media following the incident, which police are treating as a terrorist attack, appeared to show wires protruding from a flaming bucket inside a plastic Lidl carrier bag on the floor of a carriage. Police launched a manhunt to find those responsible and have since arrested an 18-year-old and 21-year-old - named locally as Yahya Faroukh. Both suspects are being held under section 41 of the Terrorism Act 2000.